Jupiter's moons Io and Ganymede will cast shadows on the planet as viewed from North America on Jan. 24, 2011. This illustration depicts the planet and moons' positions. A remarkable series of events involving two of Jupiter's most well-known moons will occur on Monday, Jan. 24, but you'll need a telescope to see them. Four hundred years ago, famed astronomer Galileo Galilei first turned his telescope onto Jupiter and discovered that the giant planet was accompanied by four large moons – Callisto, Europa, Ganymede and the volcanic Io. These satellites orbited Jupiter like a miniature solar system and gave Galileo the proof he needed that our solar system's planets revolved around the sun in exactly the same way as Jupiter’s moons circle their parent planet. 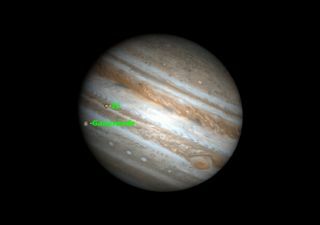 On Monday night, amateur astronomers with telescopes and clear weather will have a chance to witness a sight similar to those seen by Galileo as Ganymede and Io cross in front of Jupiter as seen from Earth. This illustration of Jupiter and its moons depicts how the planet and satellites will appear at 7:15 p.m. EST/4:15 p.m. PST from North America. Notice that the Great Red Spot will just be ending its own transit of the disk of Jupiter at that time, an added bonus. All these events are carefully predicted in advance, and are watched with interest by amateur astronomers equipped with telescopes large enough to see them. These predictions are accurate enough that they can be thrown off by the speed of light, so much so that Danish astronomer Ole Rømer used them to measure the speed of light for the first time in 1676. Usually these events happen in isolation or in pairs, but occasionally a whole series can occur in a single night. That's what will happen on Monday evening over North America. Because Jupiter is nearing the sun, it sets fairly early, so observers in any one area will see only part of the show. Between the time when the sky becomes dark enough to observe Jupiter and Jupiter gets too low in the sky to be observed. Because so many events will happen in so short a time, there should be plenty for every observer with a telescope to see. A telescope is essential to observe these events. Jupiter's moons themselves are easily seen even with binoculars, but when they get close to Jupiter, they require more optical aid. The shadows of the moons on the planet require an instrument with at least a 3-inch aperture. To see the moons themselves, a bit more is required. When the moons begin to pass in front of Jupiter, all first appear as bright specks because Jupiter's limb is darker than the center of the disk. As they pass across the face of Jupiter, Io and Europa tend to blend in with the background clouds so that they vanish in all but the largest telescopes. Ganymede and Callisto, having darker surfaces, change from bright spots on the limb to dusky grey spots in front of Jupiter's cloud belts, and are visible with a 6-inch telescope. Only Io and Ganymede will perform during Monday's Jupiter moon shadow play, but the views should be impressive for skywatchers with clear, dark skies. Here are the play-by-play predictions for Monday night, in both Eastern and Pacific Standard Time. Observers elsewhere in North America can figure out their local times from these. Observers on the eastern U.S. coast will miss the end of these events because Jupiter will have slipped below the horizon. Observers on the West Coast will miss the beginning of these events because of too much illumination in the sky at that time. But no matter on which coast you find yourself, everyone should be able to catch some of these amazing Jupiter moon crossings.